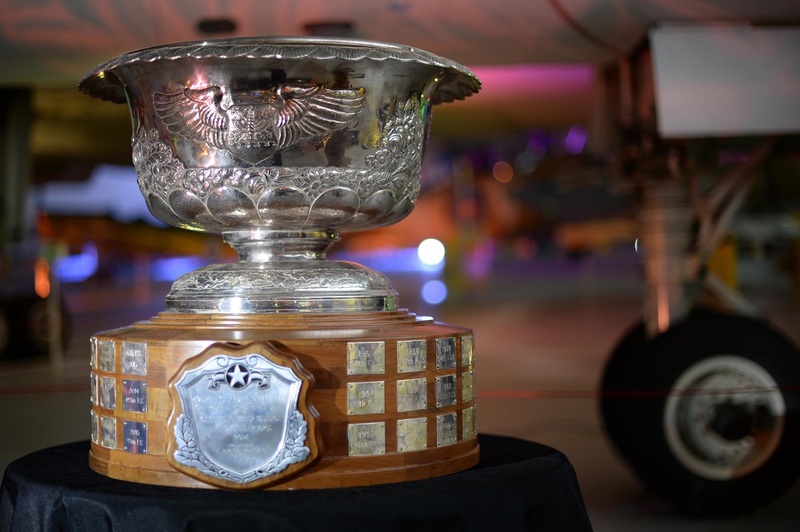 On May 13, 2017 the coveted Raytheon Trophy was awarded to the 493rd Fighter Squadron (FS), during a celebration at the Duxford Imperial War Museum, England. 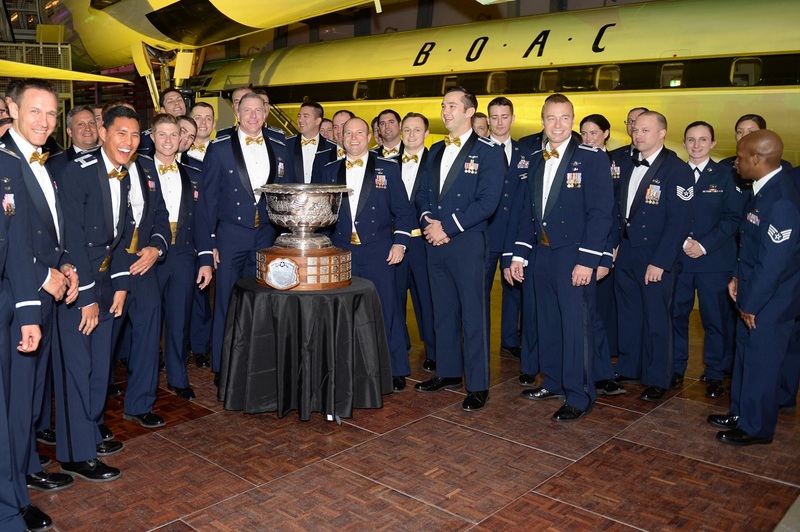 As explained by Senior Airman Malcolm Mayfield, 48th Fighter Wing Public Affairs, in the article Reapers receive Raytheon Trophy, every year, fighter squadrons across the U.S. Air Force are judged on their performance across specified mission sets, exercise participation, inspection results, and squadron and individual achievements. During 2016, the 493rd FS provided 4,858 flying hours throughout the various deployments and exercises they led or participated in. “Air Superiority is the sole and only purpose of the Grim Reapers, and tonight we are here to celebrate the fact that they are the undisputed best in the world at that calling,” said Col. Evan Pettus, 48th Fighter Wing commander. 48th Fighter Wing Airmen celebrate during the 2016 Raytheon Trophy presentation at the Duxford Imperial War Museum, England, May 13. The trophy dates to 1953 and is awarded annually to the top air superiority or air defense squadron in the U.S. Air Force. The squadron displayed teamwork and dedication to the mission during a grand total of 190 days in 11 allied countries, and by executed 146 days of deployed flying operations while integrating with 22 allied air forces. This marks the 5th time the 493rd FS has earned this recognition in 10 years. The 493rd FS, nicknamed “The Grim Reapers”, is part of the United States Air Force’s 48th Fighter Wing located at RAF Lakenheath, England. 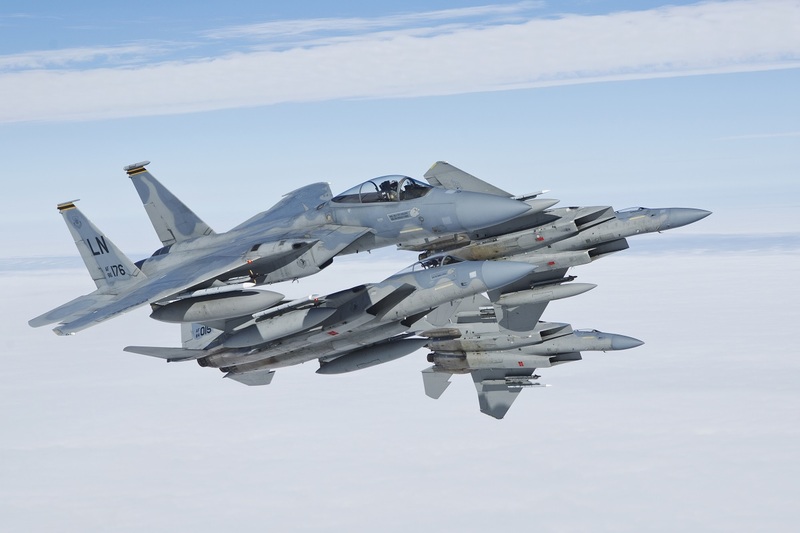 The 493rd FS is currently the only USAF squadron flying the F-15C Eagle within the U.S. Air Forces in Europe (USAFE) Major Command and has been flying the F-15C since 1994. The Raytheon trophy was presented to the 493rd Fighter Squadron during a celebration at the Duxford Imperial War Museum, England, May 13. The 493rd FS received the trophy as the U.S. Air Force’s top fighter squadron, and previously won the award in 1997, 1999, 2007 and 2014. 493rd Fighter Squadron "The Grim Reapers"